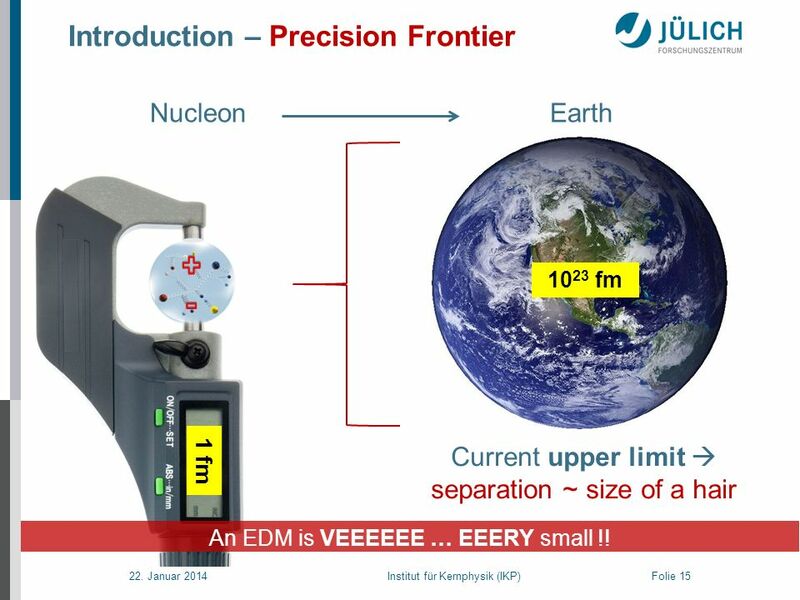 Nucleon Earth + - 1023 fm expand Current upper limit  separation ~ size of a hair 1 fm An EDM is VEEEEEE … EEERY small !! 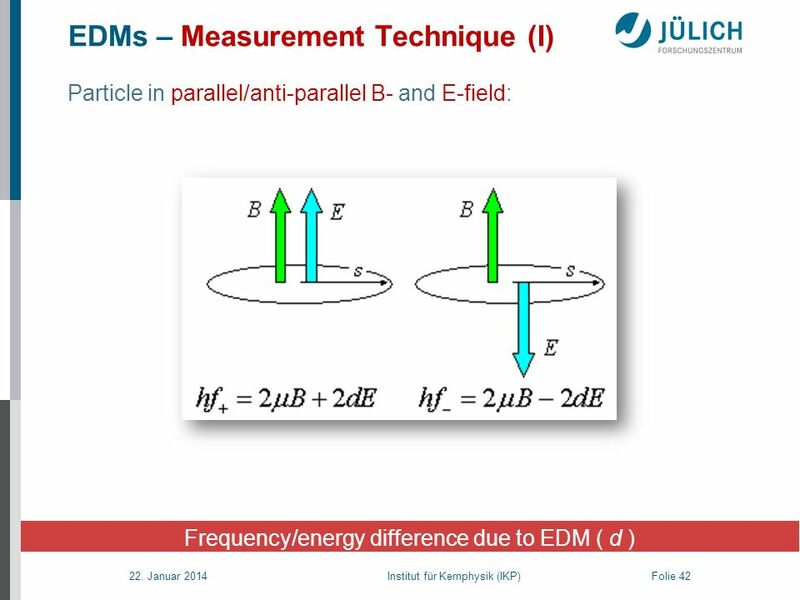 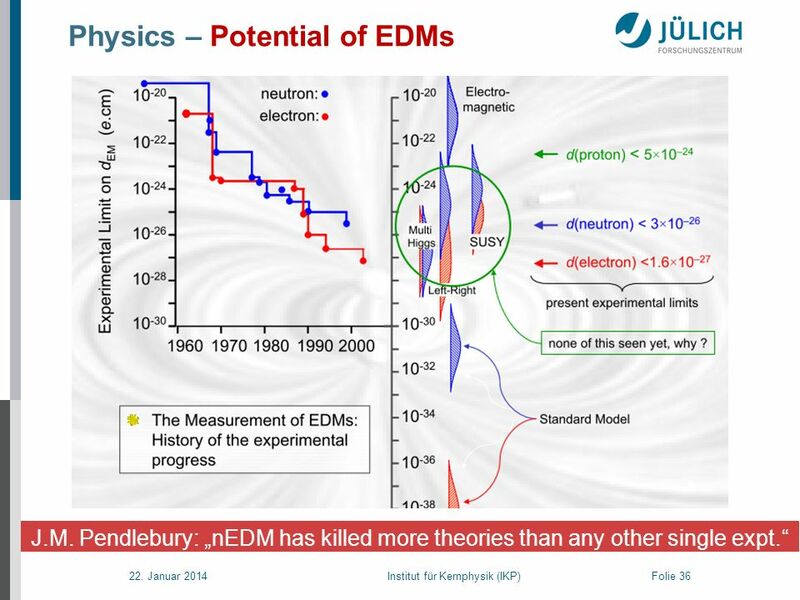 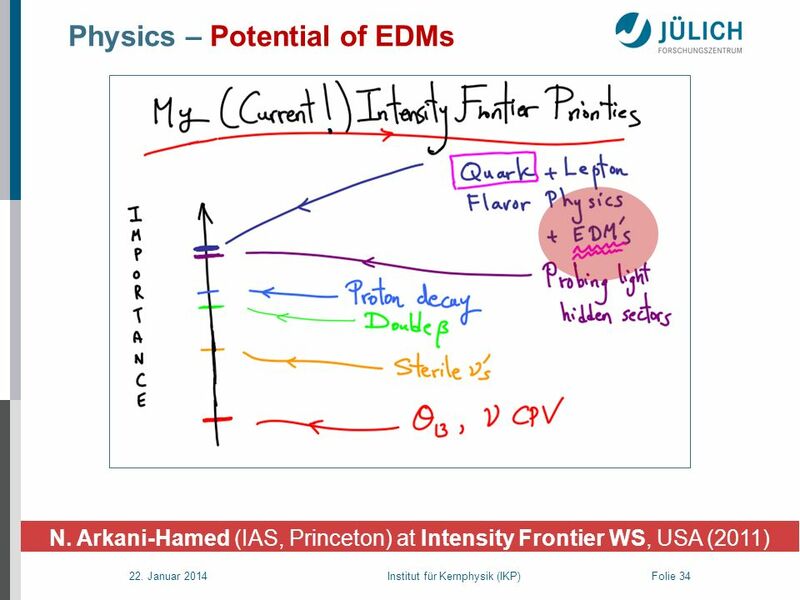 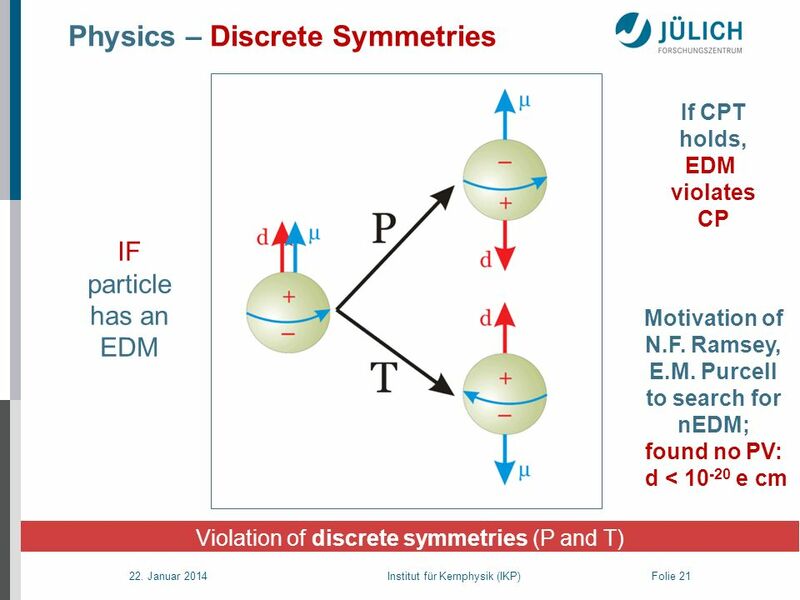 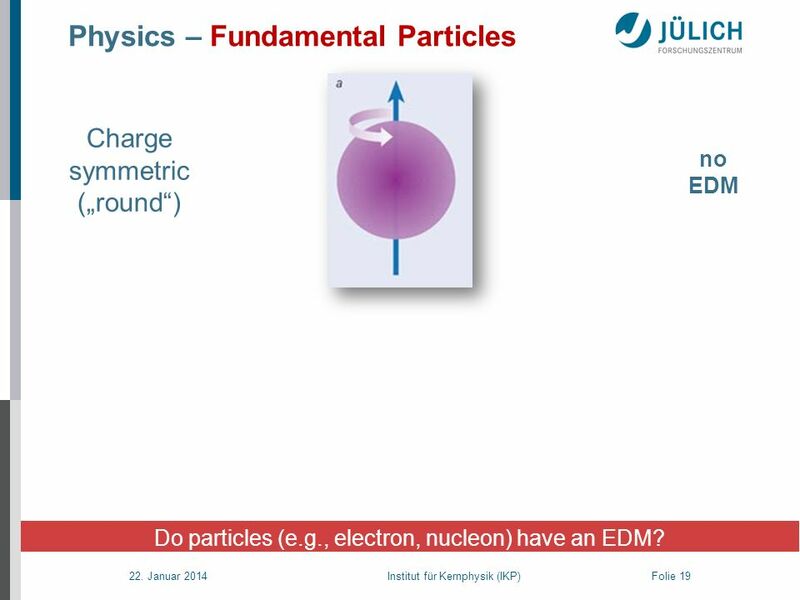 Charge symmetric („round“) no EDM Do particles (e.g., electron, nucleon) have an EDM? 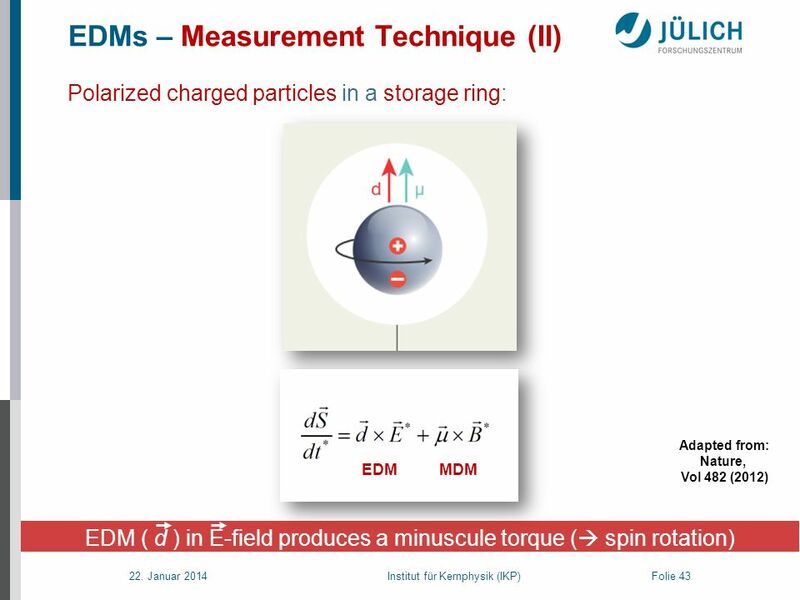 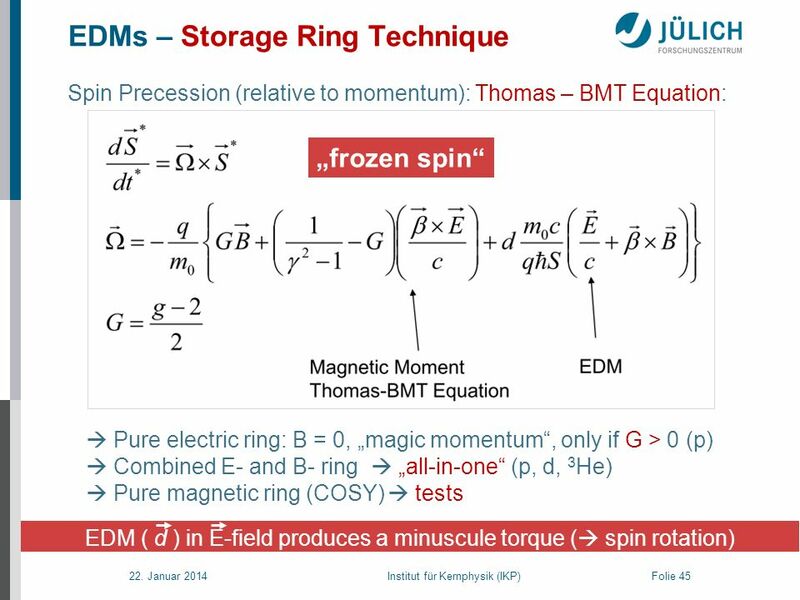 Charge symmetric („round“) no EDM EDM (aligned w/ spin) T operation creates a different state Not charge symmetric d < e cm Do particles (e.g., electron, nucleon) have an EDM? 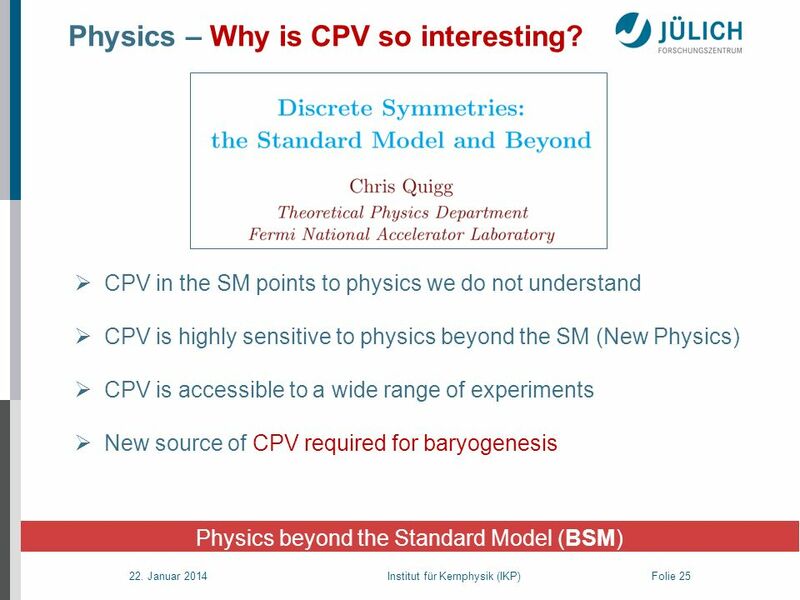 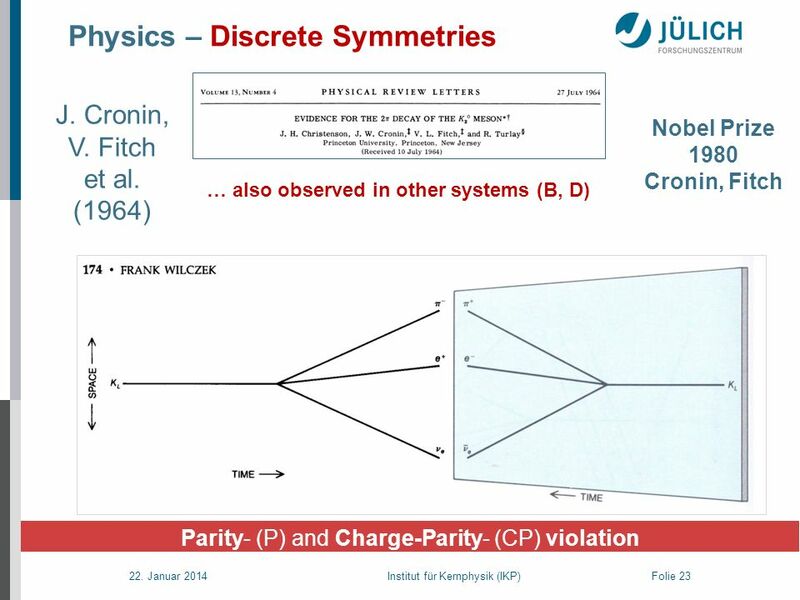 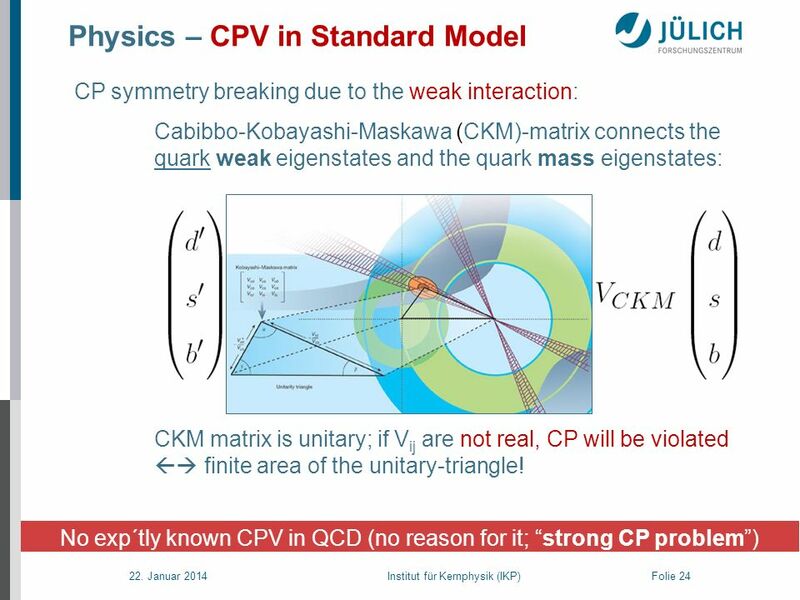 25 Physics – Why is CPV so interesting? 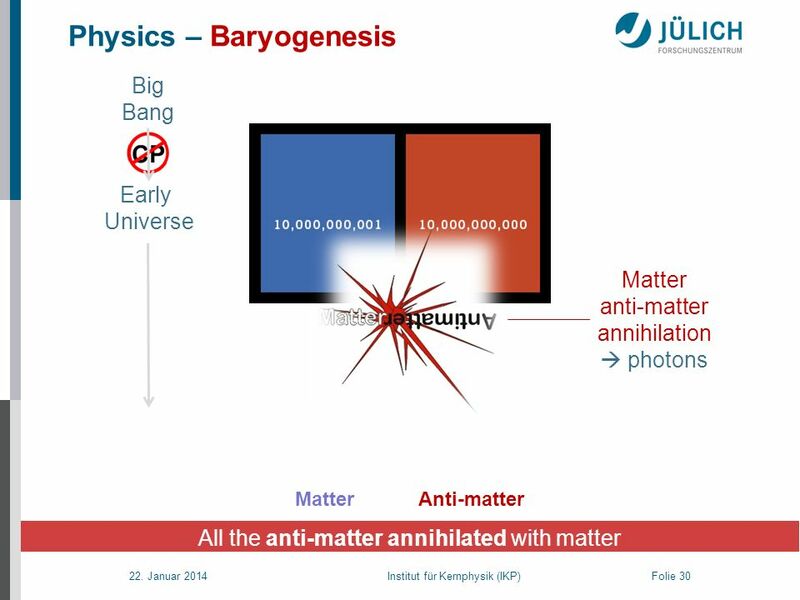 Big Bang Early Universe Matter Anti-matter Assertion: Universe „started“ with equal amounts of matter and antimatter ! 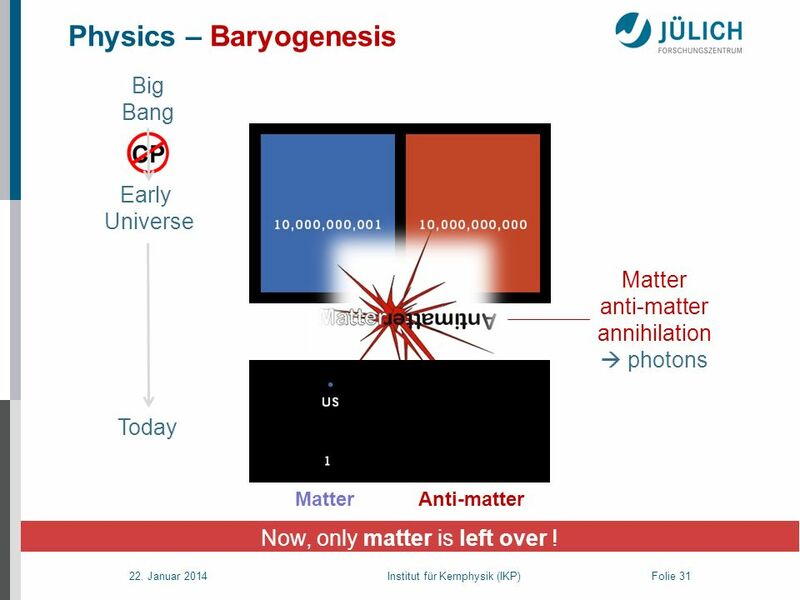 Big Bang Early Universe Matter anti-matter annihilation  photons Today Matter Anti-matter Now, only matter is left over ! 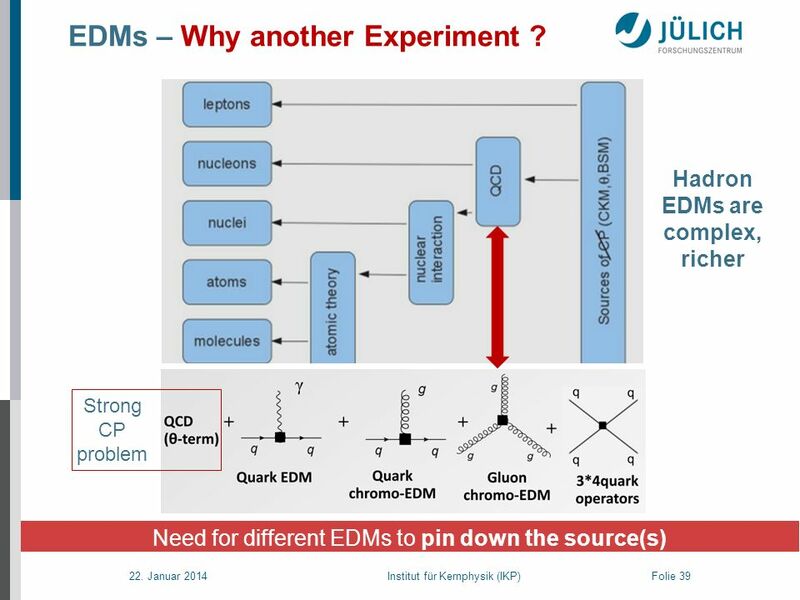 38 EDMs – Why another Experiment ? 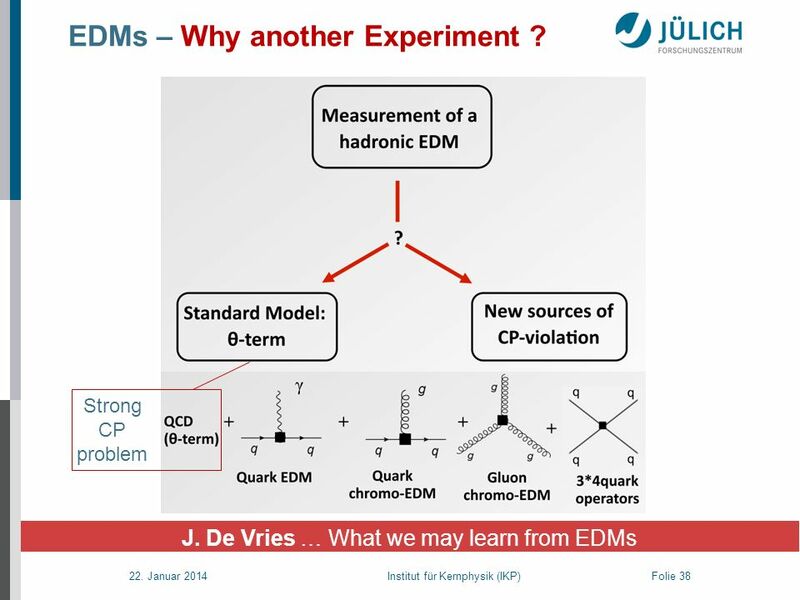 39 EDMs – Why another Experiment ? 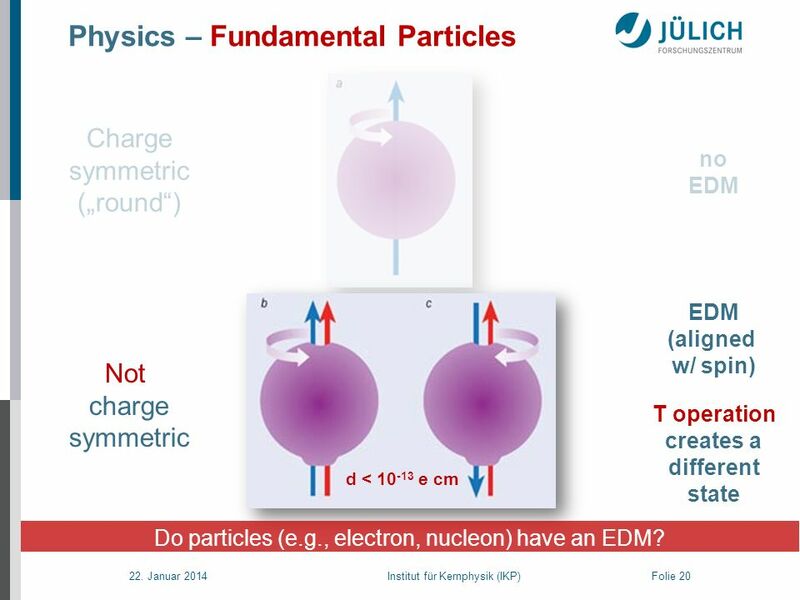 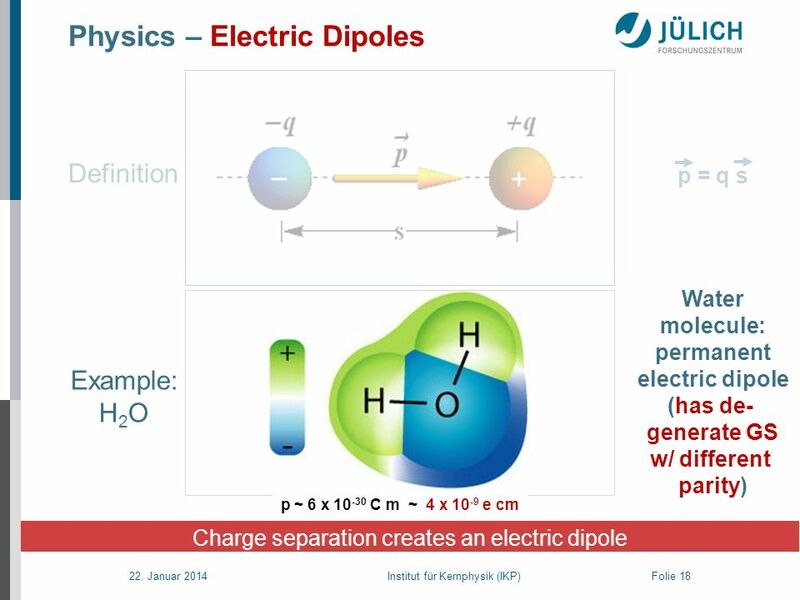 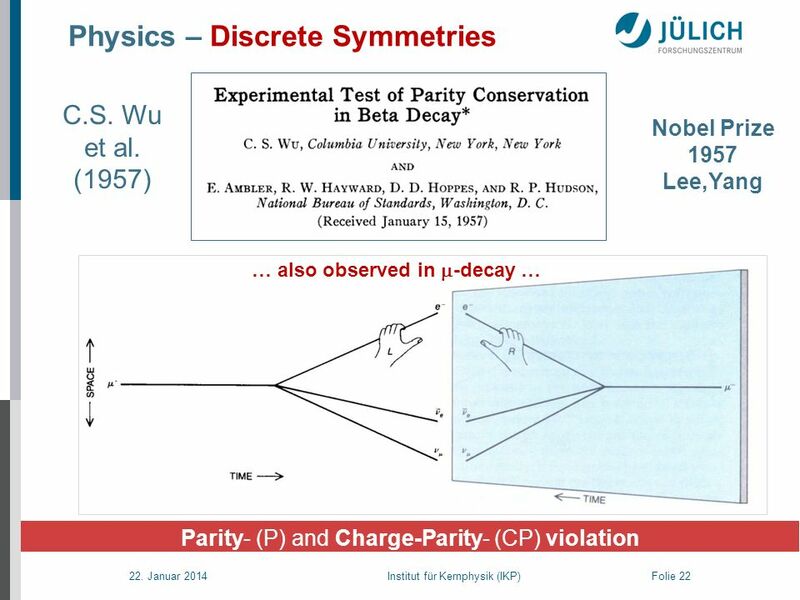 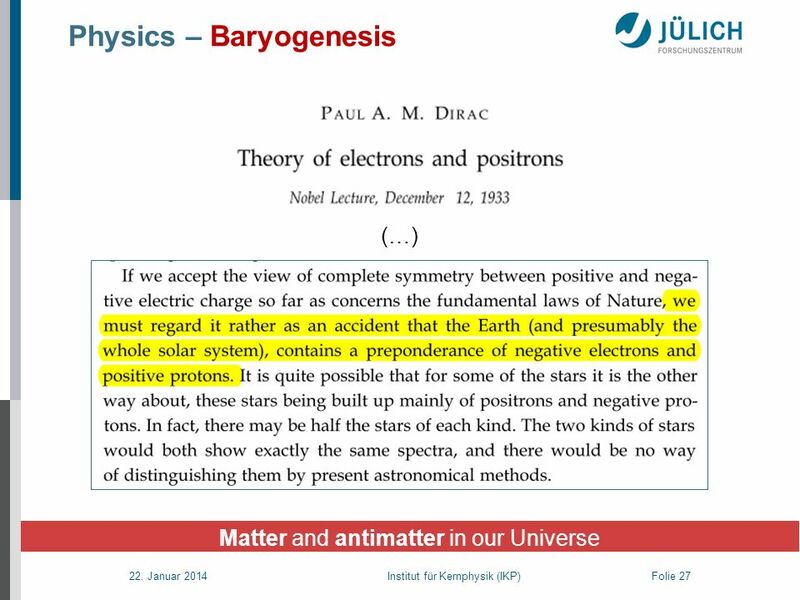 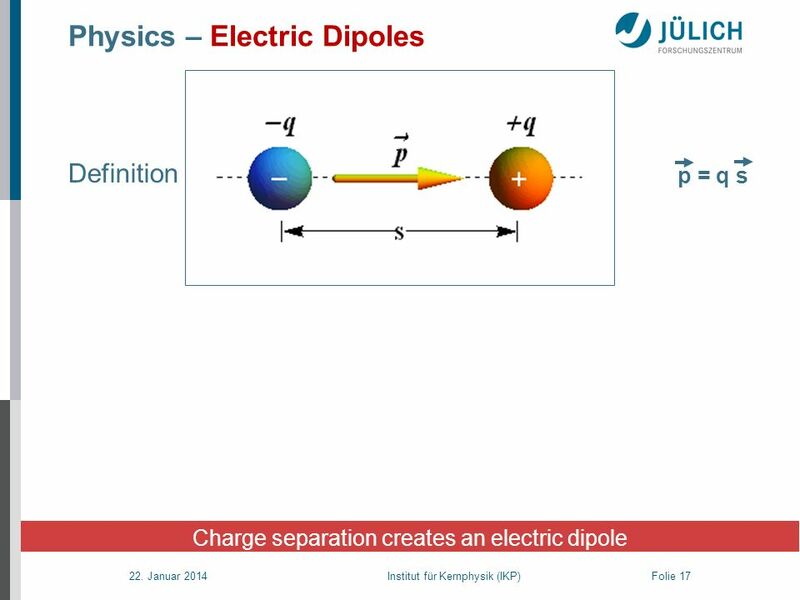 Electric Dipole Moments (EDMs) of charged particles (p,d, …): Why ? 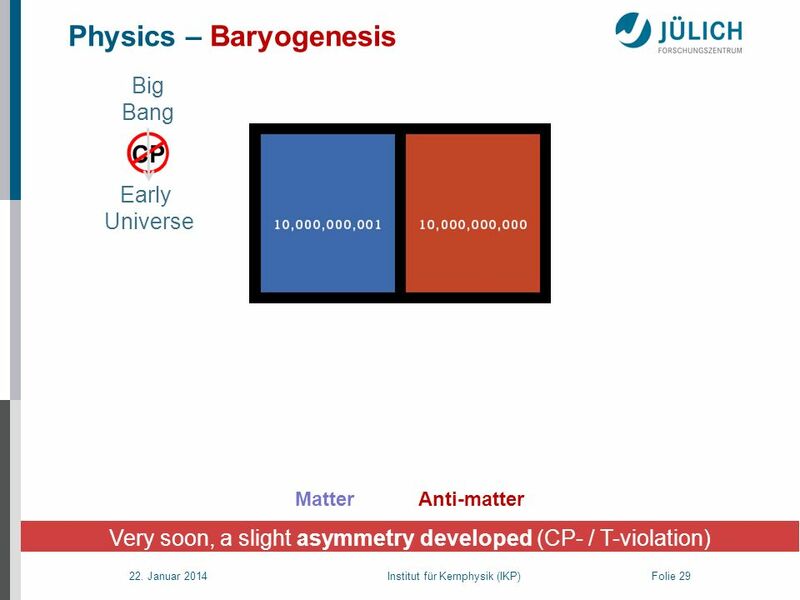 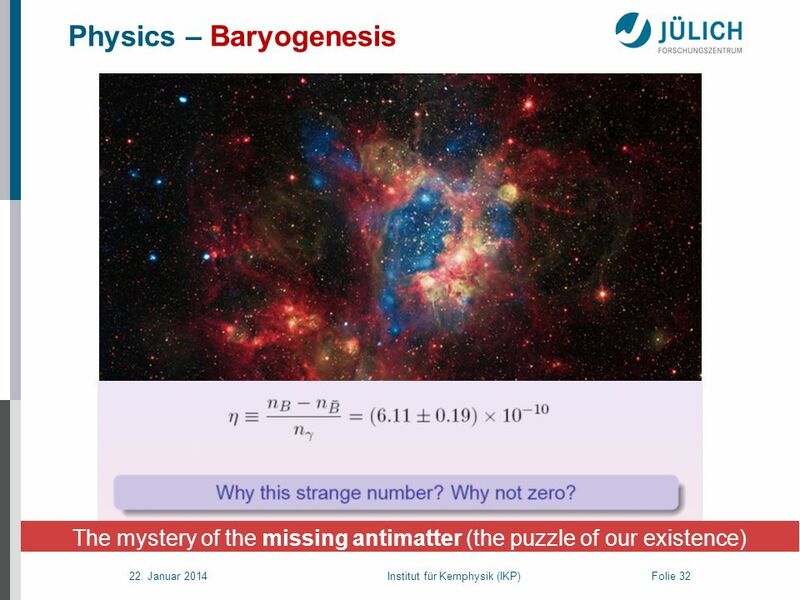 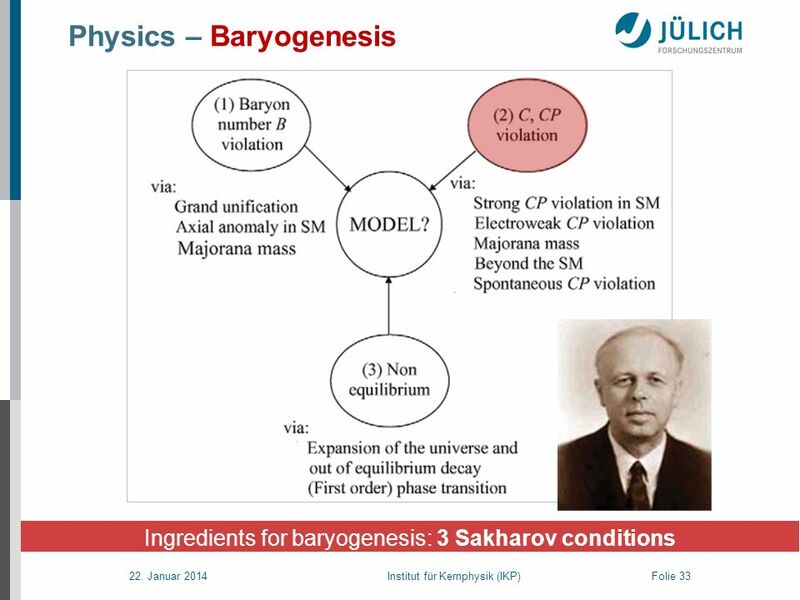 Physics case: a fundamental question Cosmic Baryon Asymmetry Physics beyond the Standard Model Highest sensitivity, discovery potential How ? 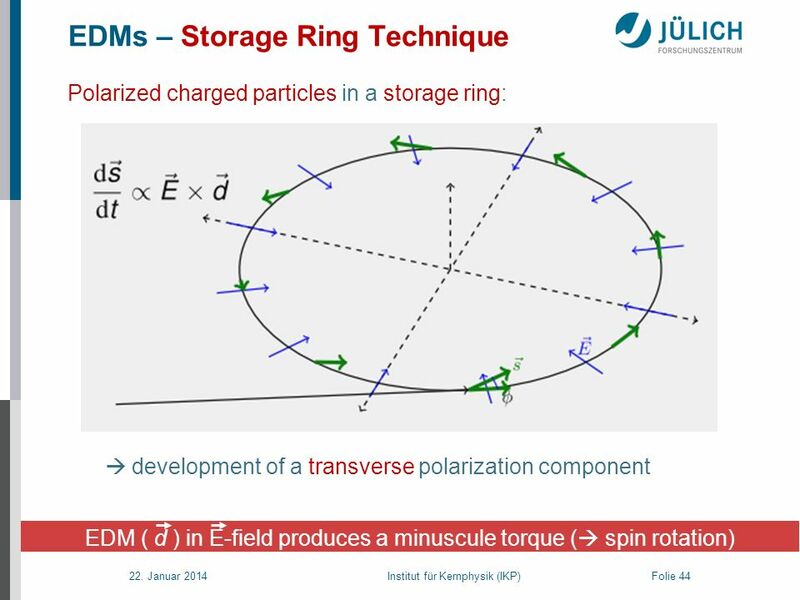 New technique: spin tracking in E-, B-fields Polarized particles Precision storage ring Where ? Jülich („best place on earth“) When ? 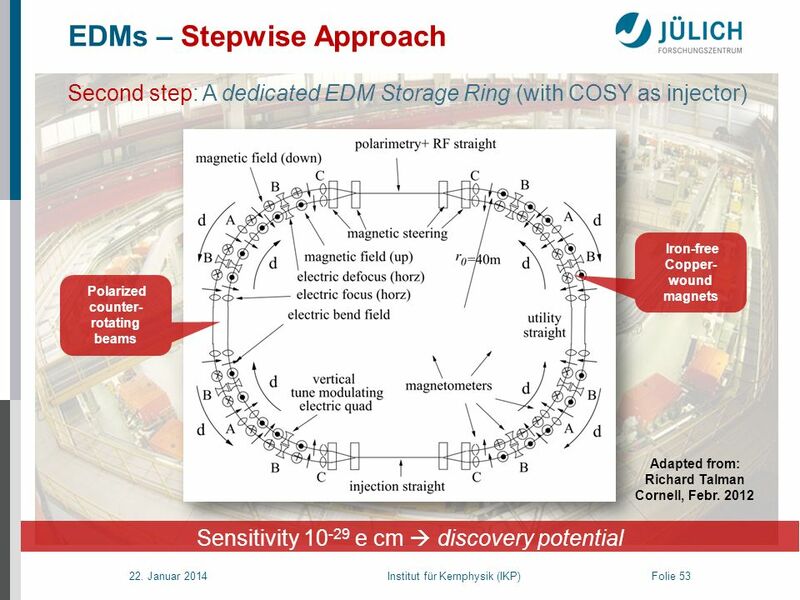 Phases: Ongoing: Tests at COSY Step 1: „Precursor“ at COSY+ Step 2: Dedicated EDM ring Spin-off ? 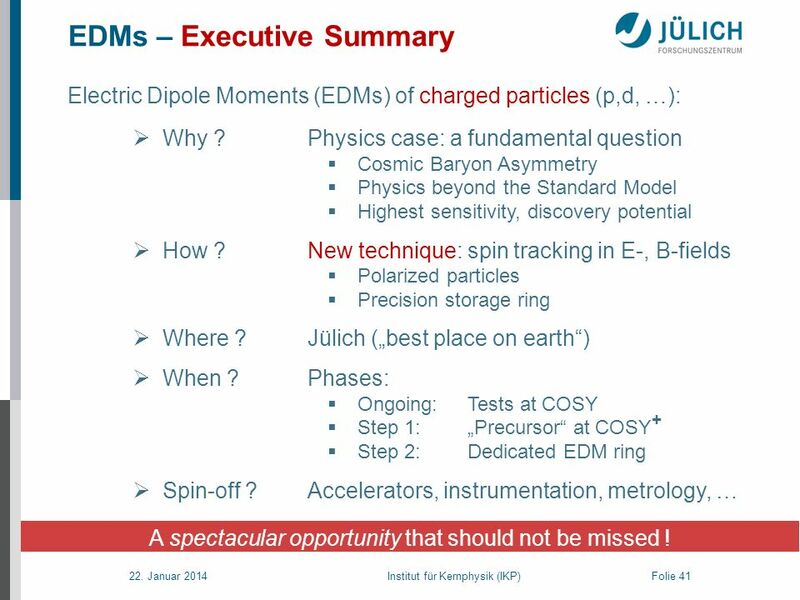 Accelerators, instrumentation, metrology, … A spectacular opportunity that should not be missed ! 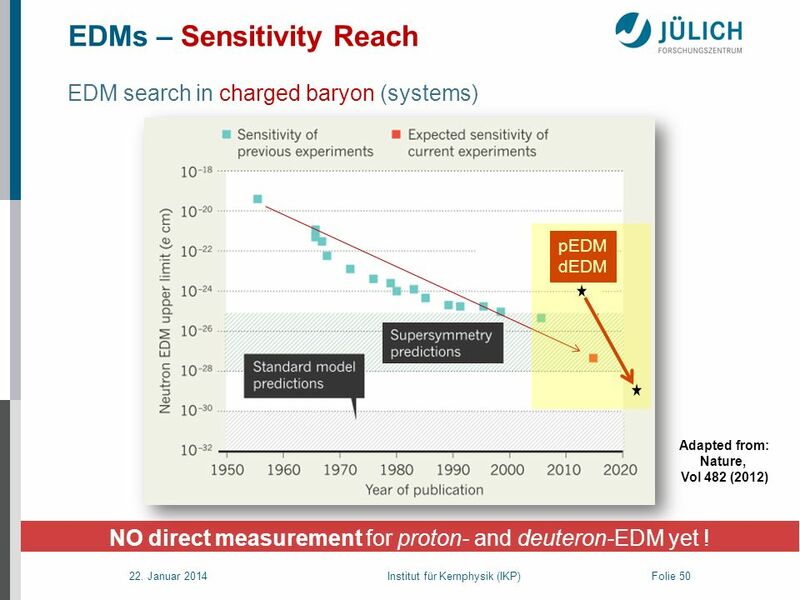 EDM search in charged baryon (systems) pEDM dEDM Adapted from: Nature, Vol 482 (2012) NO direct measurement for proton- and deuteron-EDM yet ! 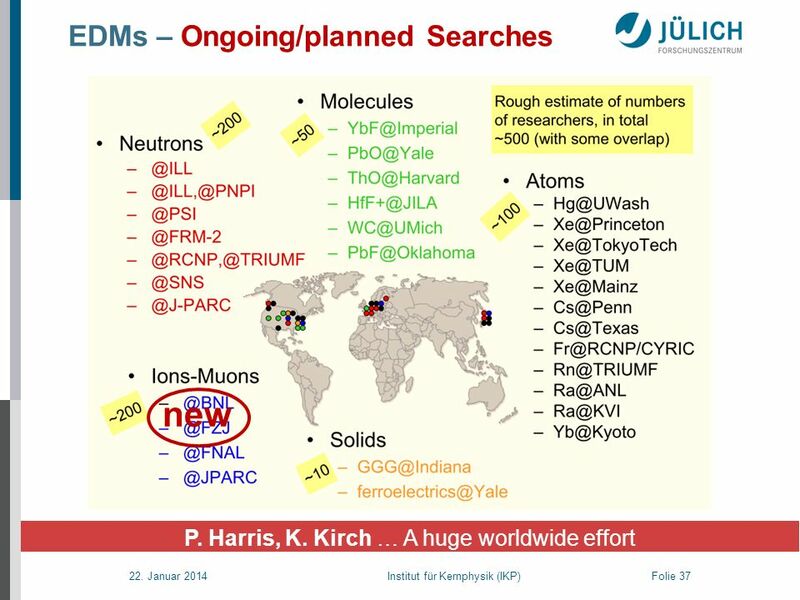 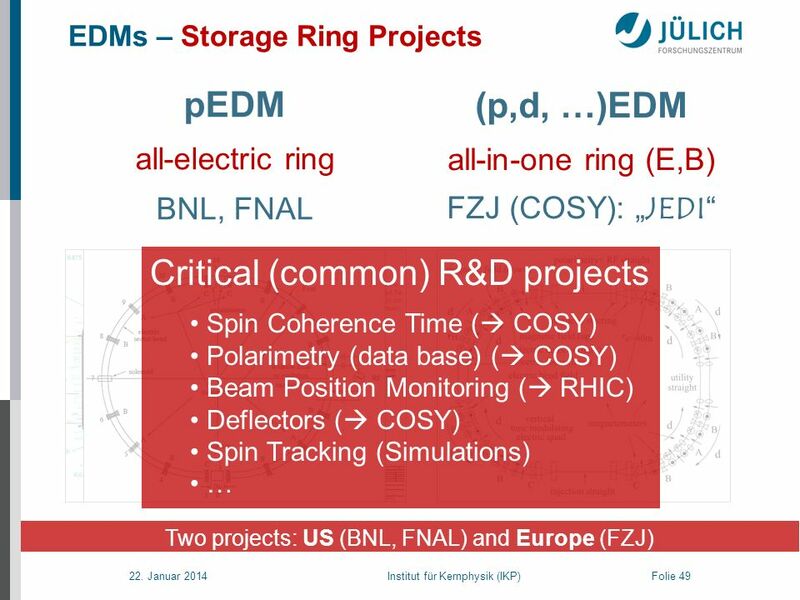 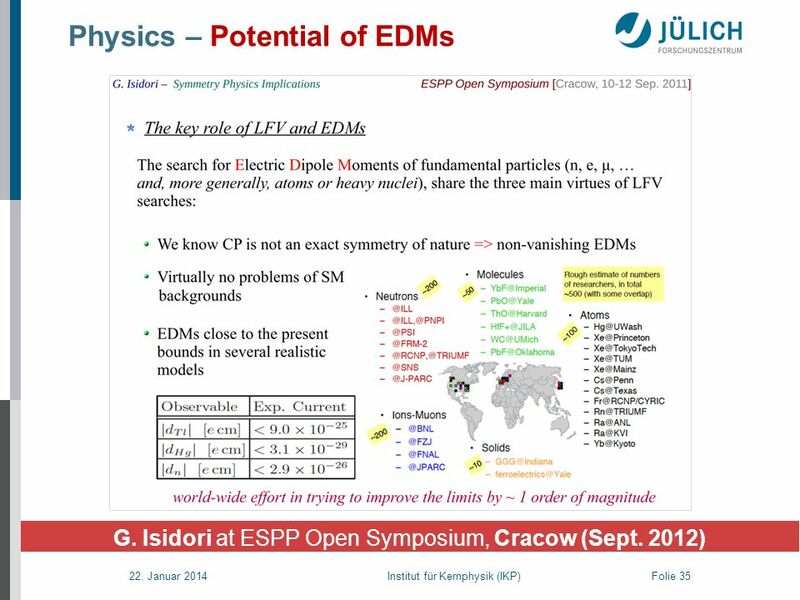 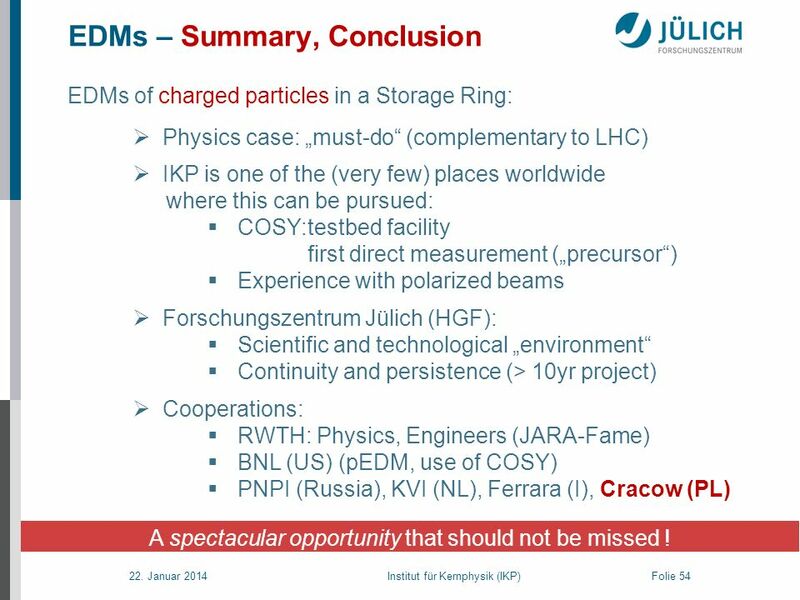 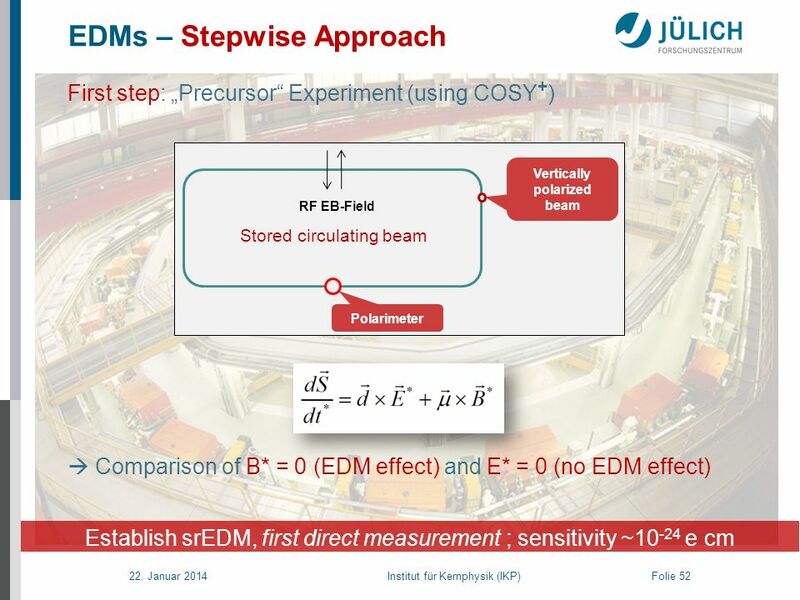 EDMs of charged particles in a Storage Ring: Physics case: „must-do“ (complementary to LHC) IKP is one of the (very few) places worldwide where this can be pursued: COSY:	testbed facility first direct measurement („precursor“) Experience with polarized beams Forschungszentrum Jülich (HGF): Scientific and technological „environment“ Continuity and persistence (> 10yr project) Cooperations: RWTH: Physics, Engineers (JARA-Fame) BNL (US) (pEDM, use of COSY) PNPI (Russia), KVI (NL), Ferrara (I), Cracow (PL) A spectacular opportunity that should not be missed ! 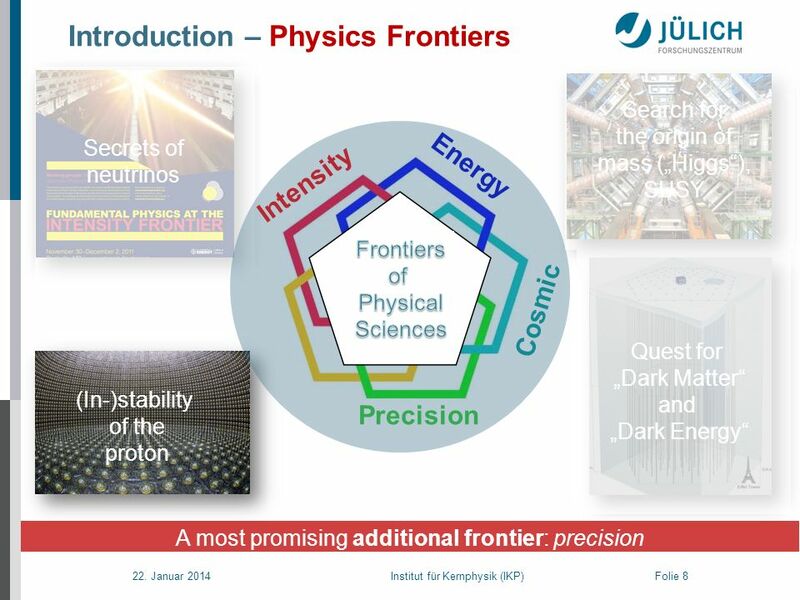 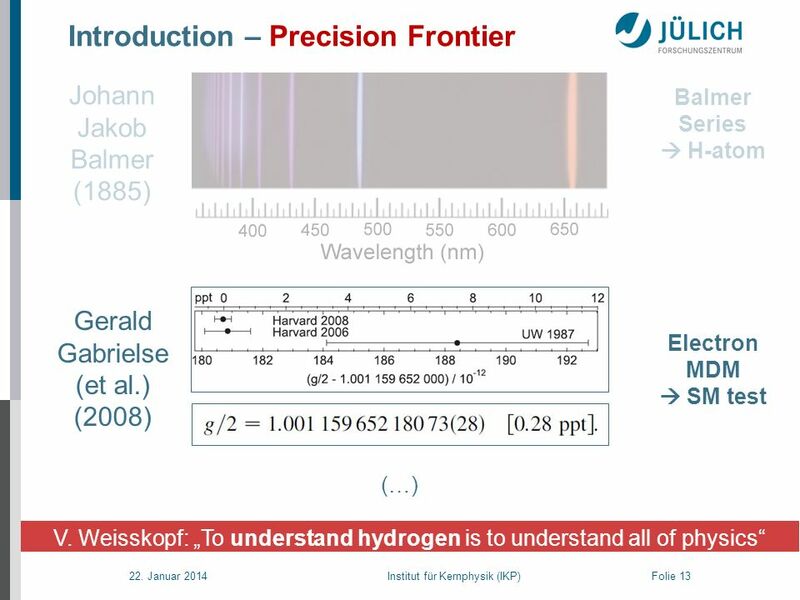 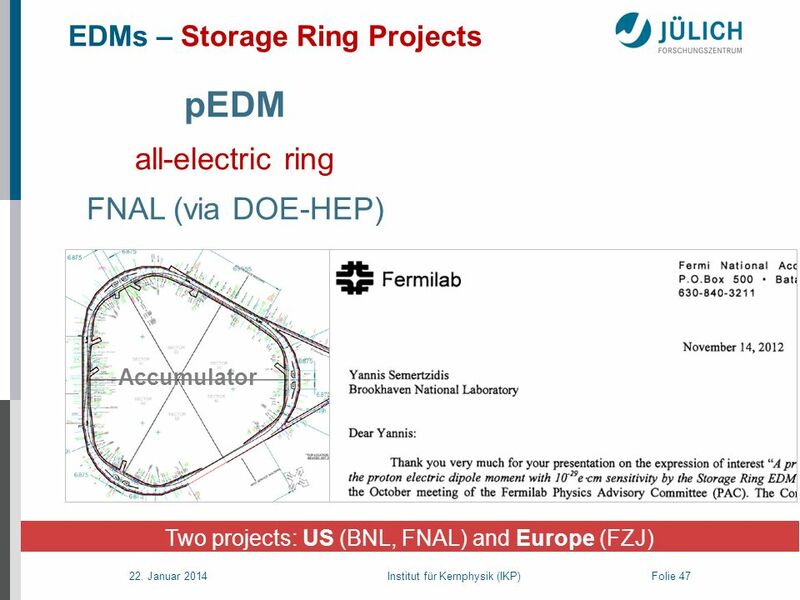 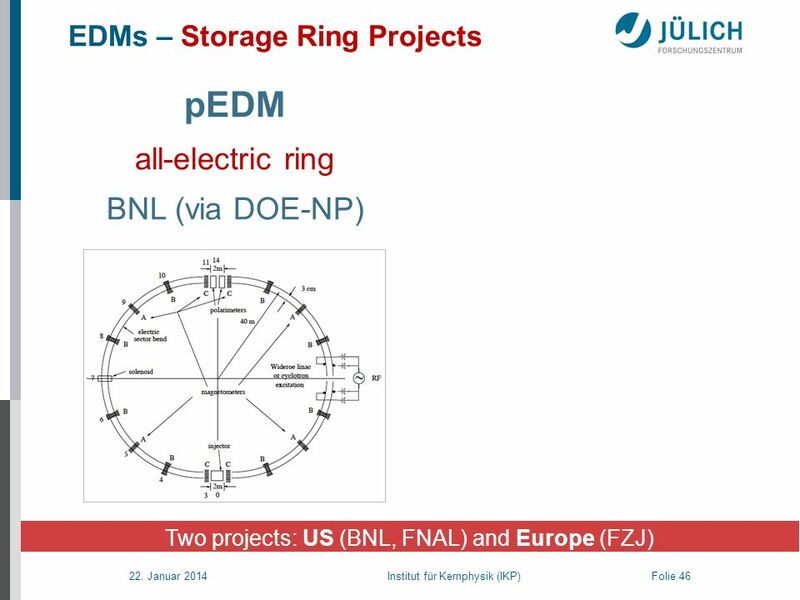 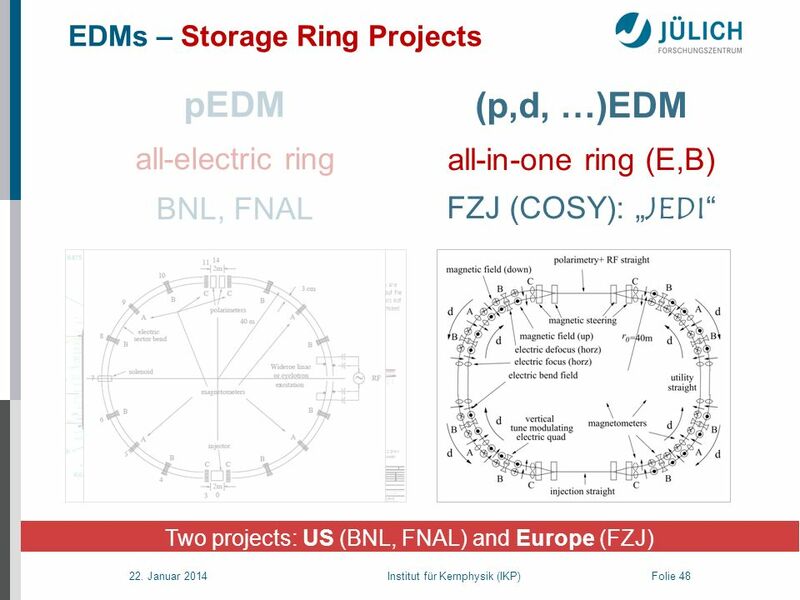 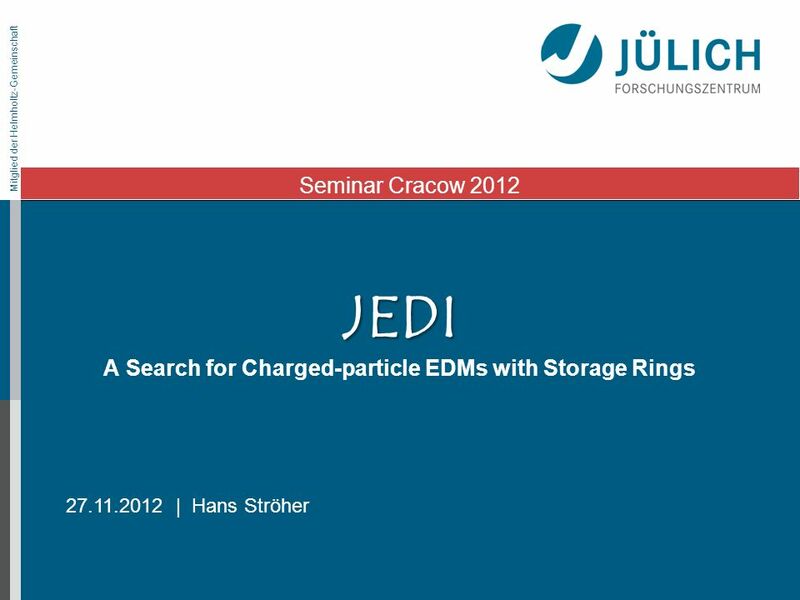 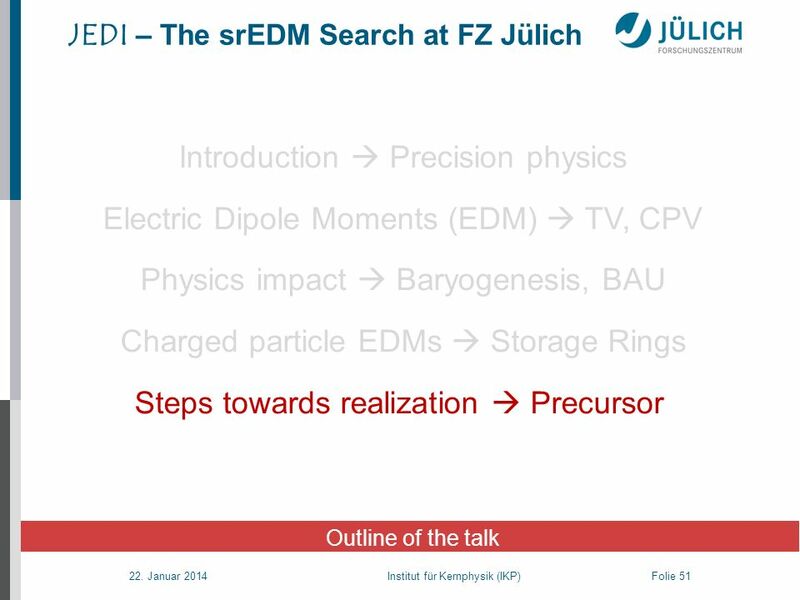 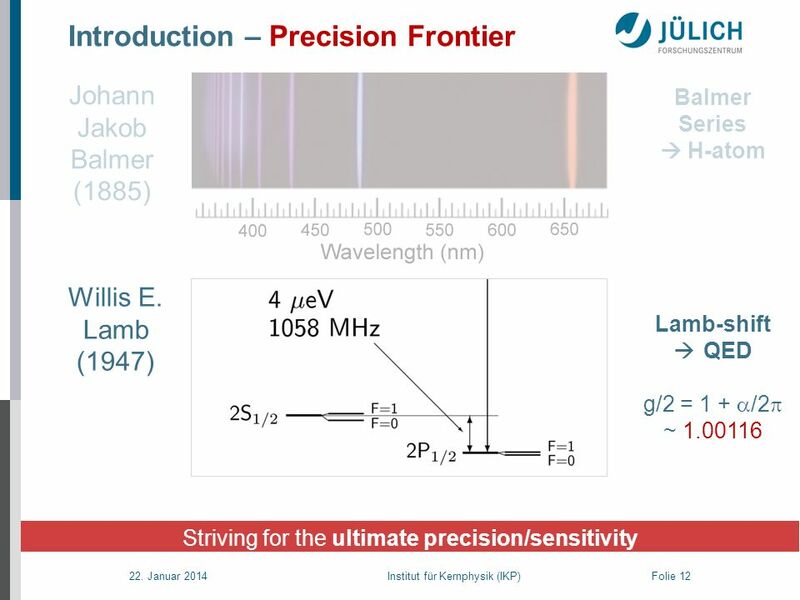 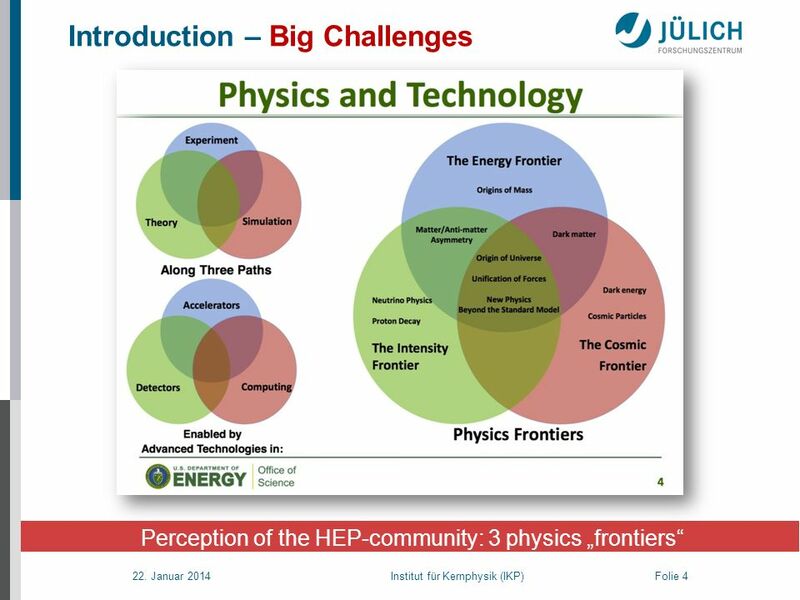 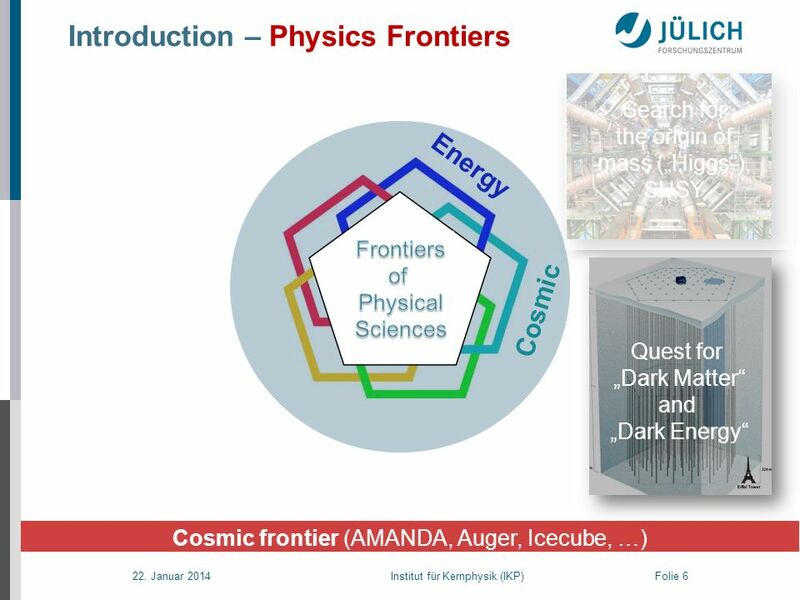 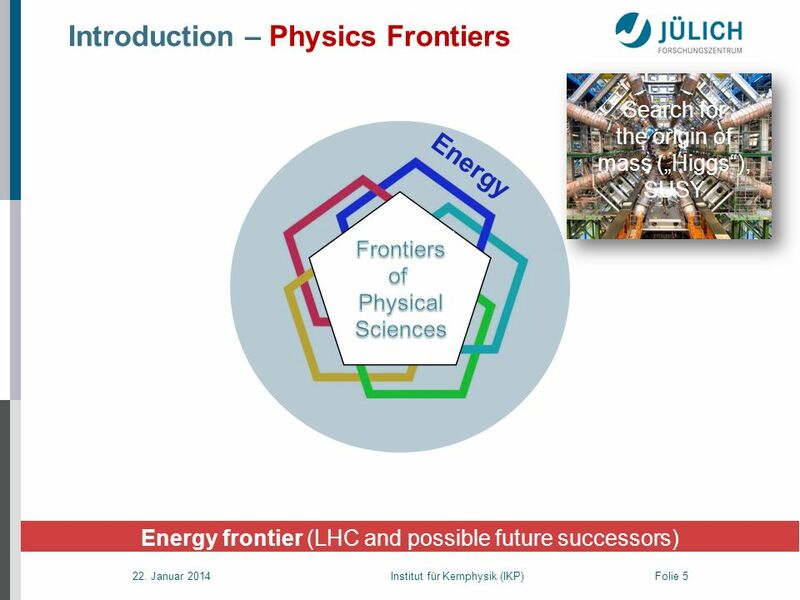 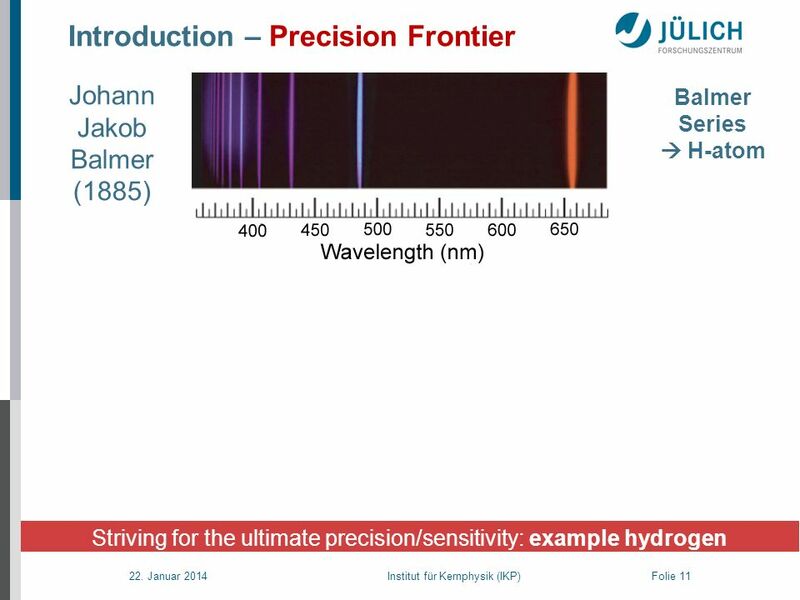 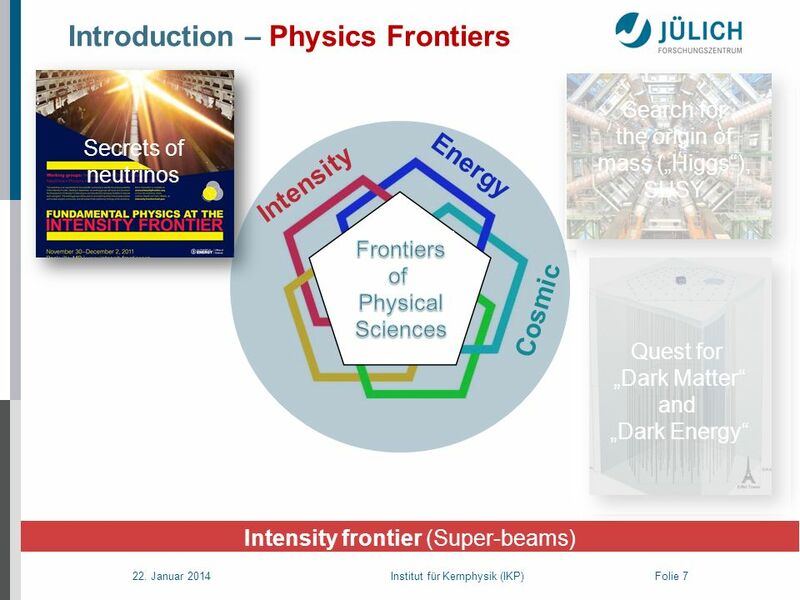 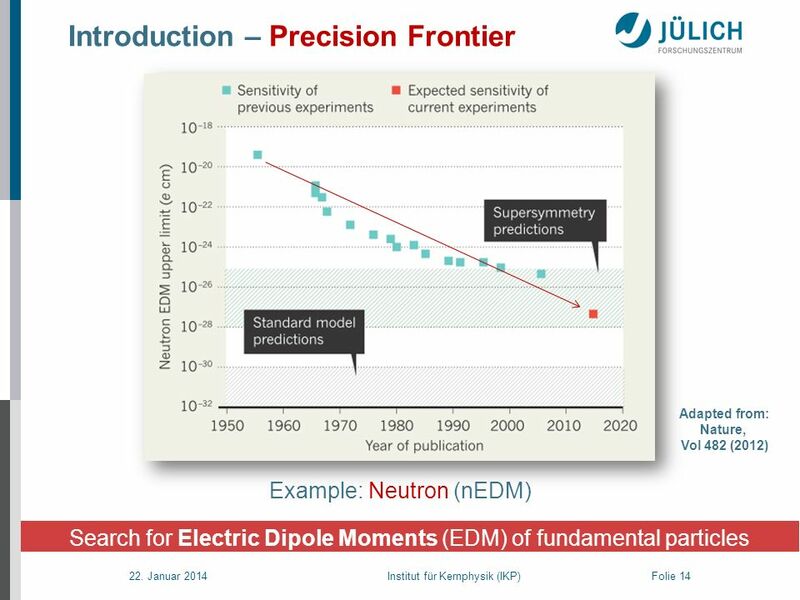 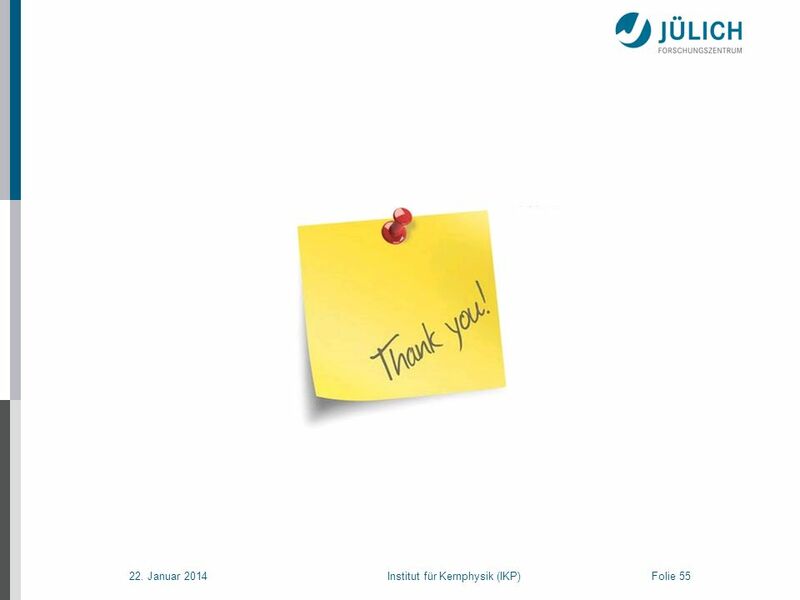 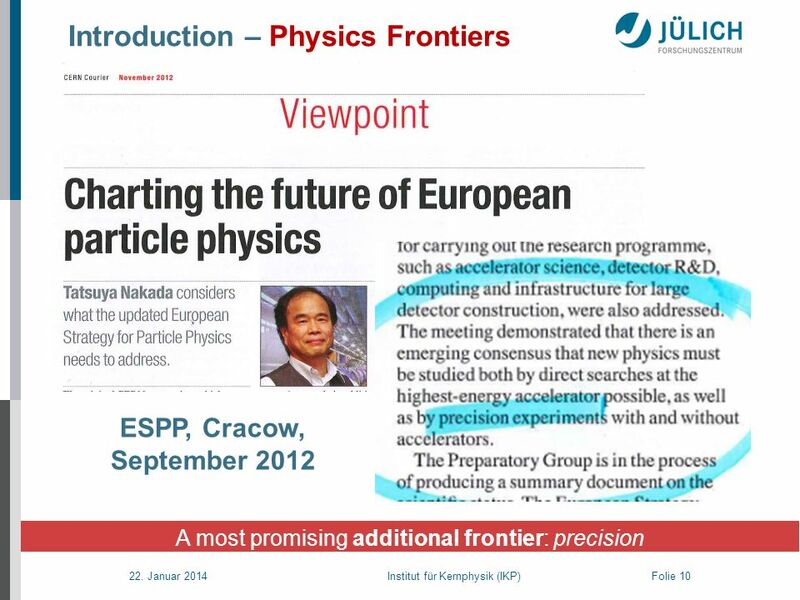 Download ppt "JEDI A Search for Charged-particle EDMs with Storage Rings"
Mitglied der Helmholtz-Gemeinschaft From Hadron Physics to the Precision Frontier A Very Short Introduction August 6, 2012 | Hans Ströher (Forschungszentrum. 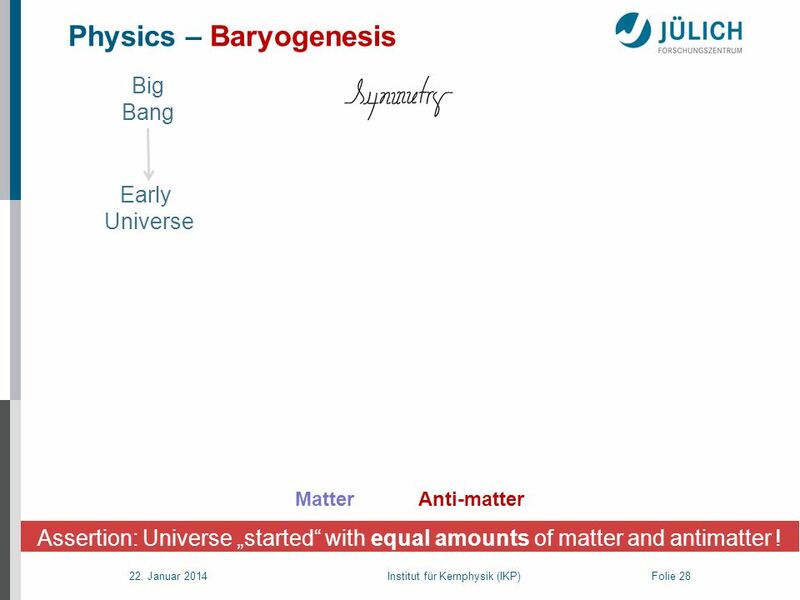 Mitglied der Helmholtz-Gemeinschaft The Fate of Antimatter January 17, 2013 | Hans Ströher JARA|FAME Inauguration.